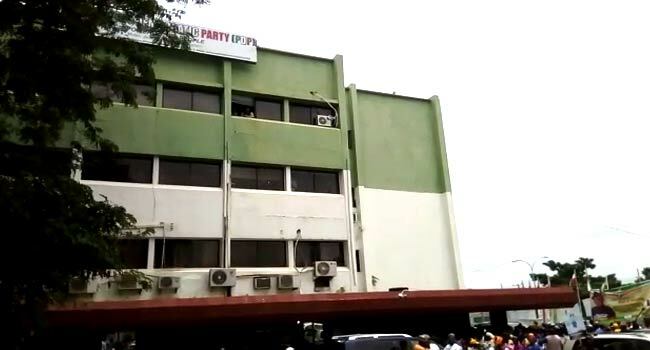 There has been a fight at the entrance of the national secretariat of the Peoples Democratic Party (PDP) in Abuja. The fight, which occurred at the Wadata Plaza where the party headquarters is located, resulted in a stampede as people scamper for safety. The situation was quickly prevented from escalating as police officers arrived at the scene and dispersed the crowd with tear gas. According to an eyewitness, the fight started when the PDP supporters spotted someone among them displaying a flag of the All Progressives Congress (APC). Former Vice President Atiku Abubakar and Taraba State Governor, Darius Ishaku, are among the prominent aspirants who are expected at the PDP secretariat today to pick their nomination forms.